Western Digital on Monday announced the WD TV HD Media Player, a $130 device that plays back high-definition video on a television. The WD TV HD Media Player also features audio and photo playback. You connect one or two USB hard drives (or a USB camera, camcorder, or mass storage device) with content to the WD TV’s two USB ports, then connect the device to a TV using either the included composite video cables or HDMI cable. (The HDMI cable is not included with the WD TV.) With HDMI, you can output HD video up to 1080p. There’s also an optical digital audio output for connecting to a surround-sound receiver. The WD TV supports a wide variety of formats. For video, it supports MPEG-1, MPEG-2, MPEG-4, WMV9, AVI (MPEG-4, Xvid, and AVC), H.264, Matroska (MKV), and MOV (MPEG-4 and H.264). For audio, it supports MP3, WMA, OGG, WAV, PCM, LPCM, AAC, FLAC, Dolby Digital, AIFF, and MKA files—plus PLS, M3U, and WPL playlists. For photos, it supports JPEG, GIF, TIFF, BMG, and PNG. It also works with SRT subtitles. For HD playback, the device supports MPEG-2, MPEG-4, H.264, and WMV9 video at up to 1920 by 1080p at 24 frames per second (fps), 1,920-by-1,080i at 30 fps, and 1,280-by-720p at 60 fps. The Apple TV, by contrast, supports H.264 video up to 1,280-by-720 at 24 fps or 960-by-540 at 30 fps. MPEG-4 videos on the Apple TV can only be 720-by-432 at 30 fps. At the same time, the WD TV won’t work with any protected content (such as downloads from the iTunes Store). 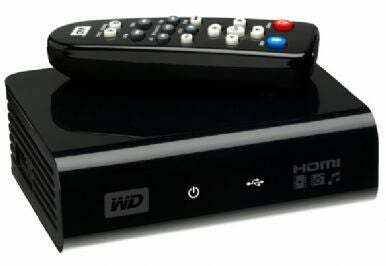 The WD TV HD Media Player acts as a go-between for your multimedia content and your TV. Although designed to work with Western Digital’s My Passport hard drive line, the company says the WD TV should work with other USB storage devices as well. I tested it with a PC-formatted My Passport drive supplied by Western Digital. The included content (MP3 audio, JPEG photos, HD MPEG-4 and SD WM9 video) played just fine connected to my 1080p Sharp Aquos HDTV. When I reformatted the drive as a journaled Mac OS Extended volume and connected it to the WD TV, however, I got a message that journaled volumes were not supported. I reformatted again as plain old Mac OS Extended, and copied several JPGs, FLAC audio files, and MKV video files in both 720p and 1080p to the drive. All played fine on my TV. Also included with the WD TV is a small remote to control selection and playback. Using the remote felt a little sluggish, but it did the trick. When navigating video or photos, you can choose to view everything, or content by date, by folder, or by how recent each file is. Audio provides the same options, but adds artist, genre, album, and playlist. The menus showed thumbnail previews for photos, but it took a long time to load them all when there were many images. And with videos, some had thumbnails, while other displayed generic icons (you can choose to view content as a list instead). There’s even a Western Digital logo screensaver the comes on after a period of inactivity. You can rotate and create slide shows of your photos, zoom in on photos and video, and search for content as well. Compared to the Apple TV, the WD TV supports more video formats at higher resolution and more audio formats. The number of files it can access depends only on the number and size of USB hard drives you have, as opposed to internal storage or network-connected iTunes libraries. And it’s smaller, black, and shaped like many Western Digital hard drives. But it’s not as elegant as using an Apple TV and, as mentioned previously, it can’t play any protected audio or video from the iTunes Store (or Apple Lossless audio). In the box you’ll find the WD TV hardware, a power adapter, the remote with batteries, composite video and audio cables, a stand for a My Passport portable hard drive, and Windows-only ArcSoft MediaConverter software.